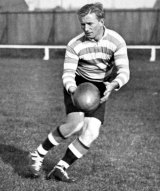 South African fly-half Bennie Osler possessed a kicking game of suffocating accuracy, his commitment to putting pressure on the opponents' set-piece helping to define the successful Springbok sides of the 1920s and early 1930s. After his debut against the British & Irish tourists in 1924 he played 17 consecutive Tests for the Springboks, where he built on the punishing physicality of his forward pack in a completely unapologetic paean to 10-man rugby. His final Test series was the Springboks' first against Australia in 1933, where his conservative game drew scorn from the press and led to a suicidal lapse in to running rugby for the second Test. The Boks were humbled 21-6 and with his point proven, he returned to his usual game-plan and secured the series 3-2. He died in 1960, aged 58, and was inducted in to the International Rugby Hall of Fame in 2007.